This 88 page sourcebook and module is the first in a series describing an eponymous science-fantasy megadungeon and the strange post-apocalyptic lands that surround it. Here, millennia after an undescribed cataclysm, the world is fragmented into self-sufficient city-states, ruled by malevolent wizards of great power. Far from being simply high-level Magic-Users, these feared beings were once human, most of them “mutated horribly in some way, whether as a result of super-science gone horribly awry, super-science gone horribly exactly as planned, or the metaphysical manifestation of their philosophies”. The wizards, masters of supernatural powers and ancient technology, rule the land as they please, or plunder it; much like the sorcerer-kings of Dark Sun, lording over an army of functionaries, slaves and soldiers. Then there are the Orbital Gods: telecommunication arrays around the planet gained sentience, personality and divine power, masters of a hundred idiosyncratic philosophies (which, unlike the unstated assumptions of most D&D games, clerics are supposed to obey simultaneously, not exclusively). Ancient metals left over from the technological era; mad cults following the Orbital Gods, a bastardisation of the scientific method or even Nyarlathotep; firearms and war machines: this is a setting where magic and high technology exist side by side – and the synthesis works, producing something in between BXCM D&D, Flash Gordon serials, Thundarr the Barbarian, Carcosa and 1st edition Gamma World, yet with its own identity. This is very important: far from being an imitative grab-bag, ASE transforms its ingredients into something more than the sum of its parts. In short: it is legitimately fantastic in a way “just an orc” and “just a robot” aren’t. A large part of the book focuses on the World of Denethix: its history, the extent of its known lands, and the city of Denethix itself, where the local wizard and his servants are known to be a little more benevolent than elsewhere. The descriptions of the setting are economic and flavourful: factions, NPCs and locales are presented with an emphasis on play-relevant information, providing just enough facts to inspire a GM, but not too much to overwhelm. Things such as the Ceratopsian Plains, the Livid Fens, Commonweal Secure Holdings, the Street of Lesser Men and even farming villages such as Marston (a place for protoceratops herders) or Southdeep (a village located in a huge sinkhole) are granted enough exotic detail to make them adventuresome – and this is greatly helped by a generous number of random tables to generate unusual curios, haute couture, horrible secrets, NPCs of different social classes, even deities. Then the Anomalous Subsurface Environment itself, a sprawling underground experimental site sealed off for untold years and now maintained by mysterious forces. Not since Necromancer Games’ Rappan Athuk and Tomb of Abysthor have I seen a published megadungeon designed with so much coherence and inner complexity. After an intro adventure (which provides a means, as well as motivation to investigate the place), we are treated to a “moathouse”-style entrance level, populated by slowly disintegrating machinery and robotic guardians locked into their own internal fight for survival, and then the sprawling first level inhabited by scavengers, mutually hostile humanoid tribes, and several challenging and entertaining dungeon puzzles. In its general ideas as well as individual encounters, ASE keeps up the quality of the outside world: it is a good megadungeon by the usual standards (such as its convoluted but navigable map mainly centred around interconnected sub-complexes, or its briefly discussed yet fairly functional dungeon ecology), but in every element, it injects its own flavour – here are stirges who have gorged themselves on nuclear goo, disintegrating office complexes hinting at the long-lost technological age, weird new monsters, humanoid lairs and enigmas whose purpose may be revealed after visiting other, yet unpublished levels. Fantasy and internal consistency are not considered mutually exclusive, but complementary: one enhances the other. 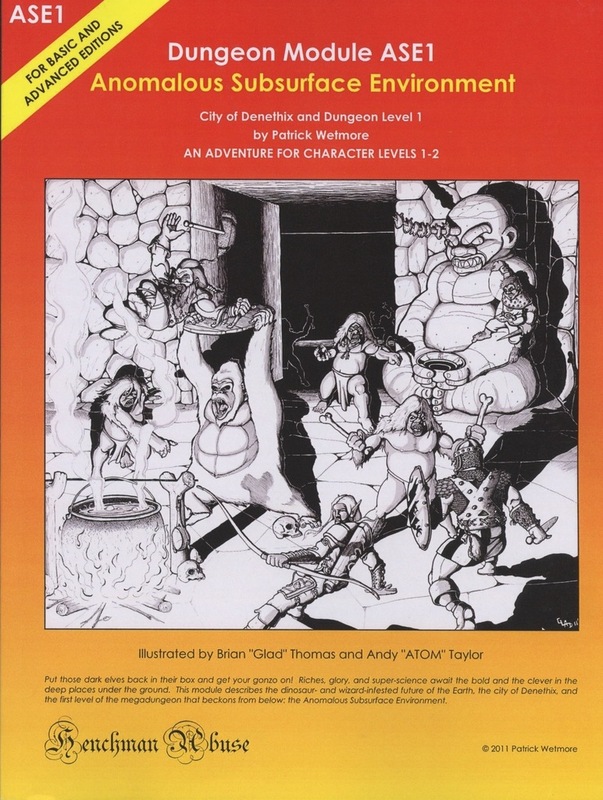 Helpful notes are provided on running the dungeon as a complex, dynamic environment, gradually introducing rival outsiders drawn to the action. This would be a great product for both advanced GMs and beginners. If there is a weakness in Anomalous Subsurface Environment, it must lie in its presentation. By that, I do not mean the typical errors that come with self-published modules: such errors are few and far between, and the product has an air of unobtrusive professionalism. However, the levels of ASE are so close, so interlinked that to run it properly, you will need at least the second part (due by the end of 2011 at the time of writing this review) to have a good chunk of the entire nine-level megadungeon complex; ideally, you should have all of it. Similar to how things were with Rappan Athuk a decade ago, until this wait is over, the product remains incomplete. Naturally, in an exotic setting, some exposition is required, and the “gazetteer” part of the volume at least gives enough material to run surface adventures in the meantime. In spite of this (temporary) problem, this is very much a product worth buying. It is not just a personal vision, handling its subject matter expertly, but also an example of a megadungeon product “done right” – which, as someone fascinated by the genre but also critical of its specimens, I greatly appreciated. In a sense, the growing realisation as I was reading through ASE1 was that I was finally holding the kind of product Yggsburgh and Castle Zagyg might have been and should have been: where the potential of the legendary 70s-style megadungeon was sadly wasted due to a range of reasons, the content and presentation of Anomalous Subsurface Environment, a much more modern successor, give us hope that this time, everything will be okay. A great megadungeon has its own legends, histories and potential to develop even more as the characters start interacting with it. It is large not by virtue of its dimensions, but by its possibilities. Anomalous Subsurface Environment 1 is the beginnings of a great megadungeon. Go buy it. Rating: ***** / ***** and the Prestigious Monocled Bird of Excellence. ASE has been on my "to buy" list for an eternity. I finally broke down and put a Lulu order in today.